Aren’t you all glad that it’s Friday night??? As always I am so excited that the week is over and the weekend is here. I am looking forward to a very relaxing weekend, going for a few hours of massage on Saturday and then just chiling on Sunday. I am tired of asking the Mother nature this question: “Why don’t you shower more snow this winter?” It’s been raining most of the days and feels like it’s Spring. Well, my hubby says I should be glad that there’s not much snow or blizzards as we don’t have to deal with blowing the snow early in the morning and to drive on snow etc etc…He’s so glad that it’s not snowing! One of my comfort foods during freezing winter is Mexican food, it can be chili soup, tacos, burritos, or just chips and salsa. These food does impart me the warmth and taste, both my body and my taste buds feels happy. A couple of days ago, I made this chicken tacos, everything was made from scratch: the taco shells and the taco seasoning. It’s healthy, yummy and great for winter. 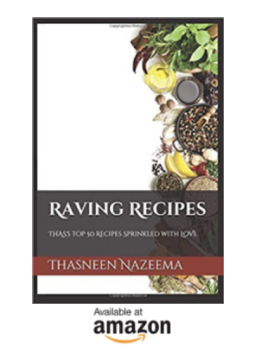 In a dry bowl, combine all the above mentioned ingredients to make the taco seasoning. Store in an air tight container. In a large bowl, combine masa harina, rice flour and salt, add water and knead well to make a soft dough. Make small balls out of the dough, keep aside. Roll the balls on a wooden board or on a clean counter top to a round shape. To avoid the dough from sticking while rolling, place the dough on a ziploc bag greased with little oil and roll it. 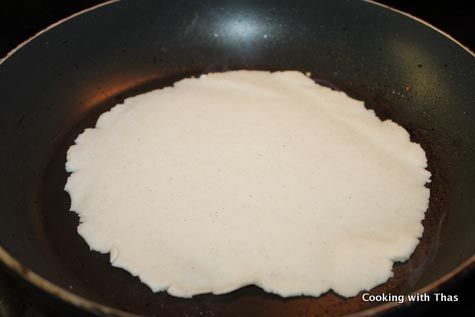 Heat a non-stick pan, spray with non-stick cooking spray. Place the rolled dough, and cook till both sides get a few golden spots. Keep aside the cooked soft shell tacos. 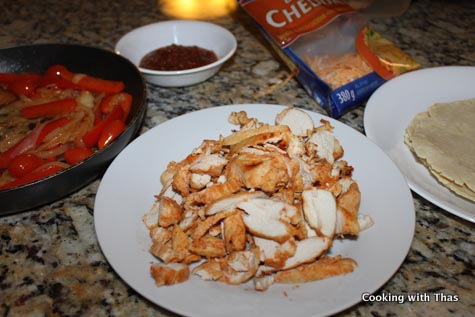 Cut the chicken breasts into thin wedges, add 1 1/2 tbsp of prepared taco seasoning to the chicken, let marinate for 30 minutes. Pan fry the chicken till it’s cooked well and turns golden brown, keep aside. You could even grill the chicken breast fillet and then cut into wedges. In the same pan used for pan frying the chicken, add oil, add the onion and red pepper to it. 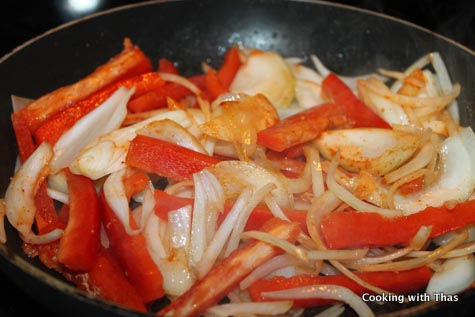 Sprinkle 1 tbsp of taco seasoning over it and stir fry the veggies till it turns golden in color. Add the cherry tomatoes and stir fry for a couple of minutes. Keep aside the cooked veggies. 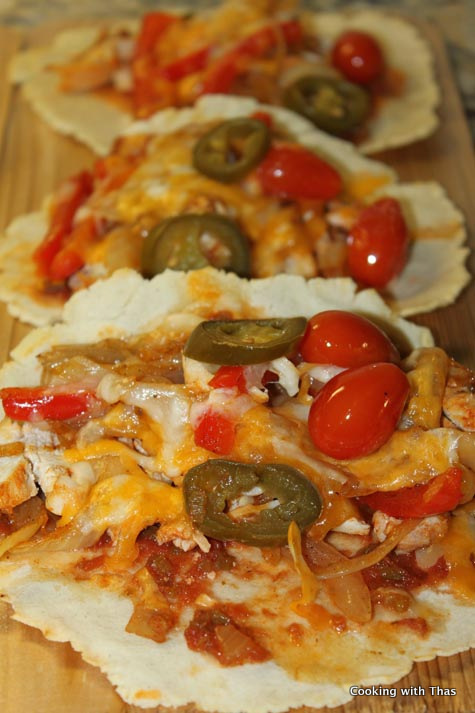 Create a chicken taco station, have the cooked chicken, veggies, soft shell tacos, cheese, salsa and jalapeno ready. 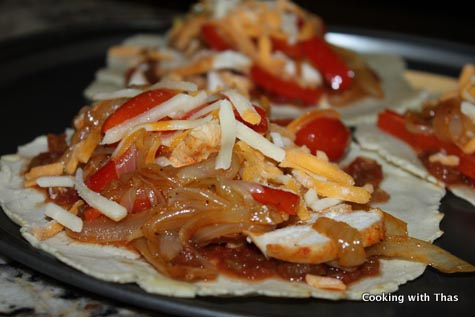 Spread 2 tbsp of salsa on each soft shell tacos. 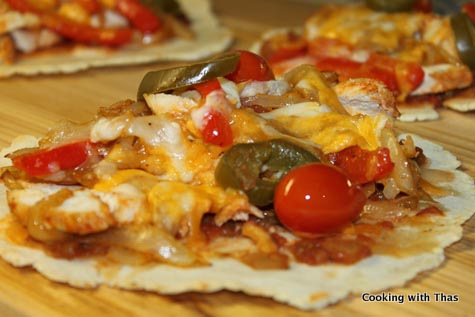 Place some cooked chicken on top of it, place cooked veggies on top of the chicken, add 3 slices of pickled jalapenos, garnish the top with cheese. Turn on the broil mode in the oven to low. When the broiler is ready, place the chicken tacos on a baking sheet and place it in the top rack of oven. Broil for 30 seconds till the cheese has melted and turns light golden in color. Don’t over broil it as the cheese with burn. Remove from the oven, if you want you could wrap the tacos and serve along with more salsa. You could use store bought taco seasoning and taco shells. Cut the chicken breasts into thin wedges, add 1½ tbsp of prepared taco seasoning to the chicken, let marinate for 30 minutes. Pan fry the chicken till it's cooked well and turns golden brown, keep aside. Broil for 30 seconds till the cheese has melted and turns light golden in color. Don't over broil it as the cheese with burn.